contact with the wild nature of Sardinia. Ideal for those who love nature but do not want to renounce to style and service. For the size of the rooms and the very quiet atmosphere of the place, Charming recommends La Coluccia Hotel & Beach Club to dynamic and modern couples. One of the first Boutique hotel in Sardinia and member of Philosophy Collection, the La Coluccia Hotel & Beach Club is situated on the North coast of Sardinia, in front of the Island of Spargi (Archipelago of La Maddalena) and at the beginning of a picturesque 4-km-long bay bordered by the protected area of the Coluccia Peninsula. In an enchanting and secluded position, it’s the perfect place to absorb the magical atmosphere of the island. The Design Hotel La Coluccia stands out due to its exclusive and elegant setting, featuring contemporary design and décor. The 45 rooms are either located on the ground or on the first floor. They are tastefully furnished with care for details and have all a bathroom with shower, hairdryer, satellite TV, air conditioning, complimentary Wi-Fi connection, minibar, safety box. Comfort (2/3 beds) double room on the garden side. On request and only available in some rooms it is possible to add a small bed of 150x70cm for one child under the age of 5 years. 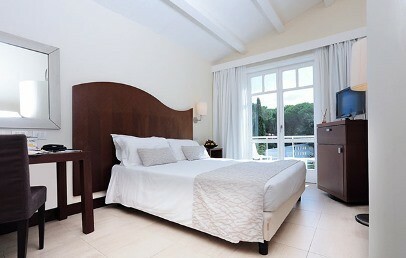 Superior (2/3 beds) double room with lateral sea view. On request and only available in some rooms it is possible to add a small bed of 150x70cm for one child under the age of 5 years. A fresh Mediterranean pinewood separates the hotel from a delightful sandy beach (50 m away) edged with granite rocks. Sun-beds, umbrellas and beach towels are provided by the hotel free of charge. There are plenty of sporting activities available nearby, including water sports 4 km away, horse-riding at around 12 km, Golf at the Pevero Club 45 km in Costa Smeralda. The hotel restaurant offers an excellent choice of local and international specialities. The half board basis includes a breakfast buffet and served dinner with four courses (appetiser, first and main course, dessert), all the beverages are excluded. Lunch may be "à la carte" at the restaurant or a light snack at the bar with extra charge. La Coluccia Hotel & Beach Club is equipped with every modern facility, a small beauty centre with two massage rooms; free access to the turkish bath, gym and relax zone. The focal point of the complex is the fascinating terrace restaurant overlooking the sea and the enchanting swimming pool. Services: reception open 24 hours a day, porter service, elevator, unattended car park, piano bar entertainment. There is an extra charge for mountain bikes, scooters and car hire. Shops, restaurants and various services are available in Santa Teresa Gallura (12 km) and Palau (14 km). In the nearby Porto Pozzo (4 km): supermarket, bar, restaurant and pizzeria. At the beach it is possible to rent rubber dinghy. Small pets are allowed, on request and with a supplement of € 15 per day (food excluded). The city tax is € 1.40 per person per overnight, to be paid on-site. 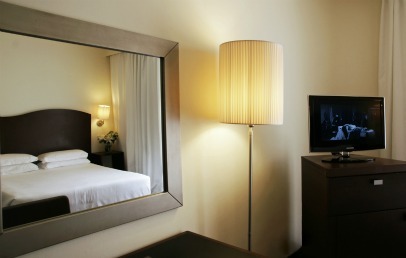 Bright and garden side double room, located in the ground or 1st floor. It is characterized by a perfect mix between tradition and modernity which provides an essential and equilibrate design. The private bathroom is equipped with a circular column-style shower and hairdryer. 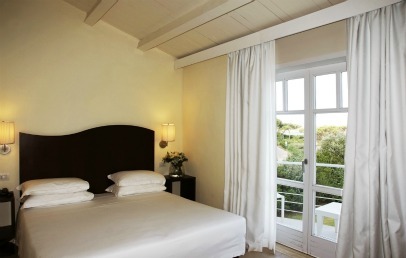 All rooms have view on the garden and a small balcony or a French balcony. Spacious sea side double room located on the ground or 1st floor. 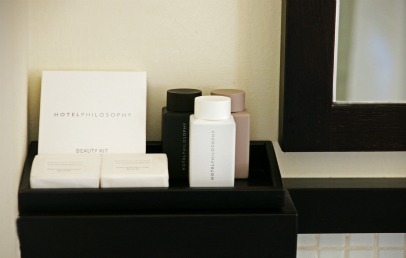 It is characterized by a minimalist and essential design, in line with the hotel atmosphere and concept. The private bathroom is equipped with a circular column-style shower and hairdryer. 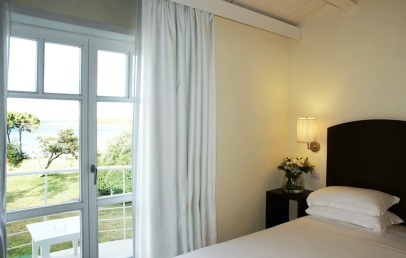 All rooms have lateral sea view with a small balcony or a French balcony. 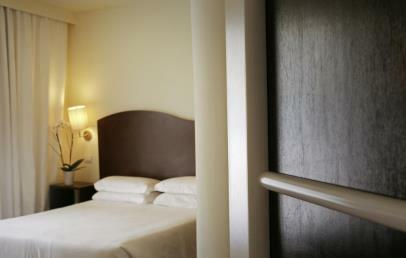 Comfortable double rooms that feature air conditioning and free Wi-Fi.